Ravenna was an important city in the history of the Roman Empire. The city was enriched with many outstanding monuments and buildings during its Gothic period (from a.d. 493) and Byzantine period (from a.d. 540). 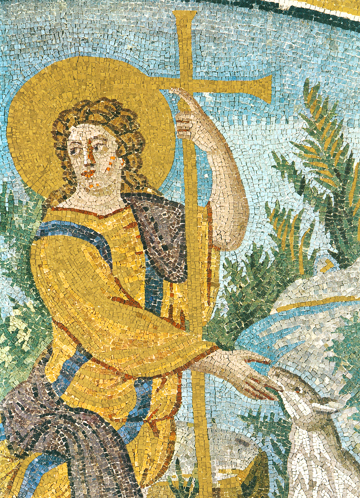 In particular, many great mosaic icons were completed in the churches and other buildings during the Byzantine period. This icon is among them and is in the Galla Placidia Mausoleum. As the Good Shepherd, Christ leads His flock of the Faithful, and they hear His voice and another they will not hear (cf John 10:3-5). The Lord seeks that one lost sheep of the hundred, and also seeks those to be brought into His fold so that “there will be one fold, and one shepherd.” (John 10:16) There is only one Good Shepherd Who lays down His Life so freely in love to fill His House and His Kingdom with all who will respond in simple love. Christ in this icon detail is a beardless youth holding the Cross in His left hand and reaching out to touch one of the sheep of His fold. His face and figure are both Classic, powerful, merciful, and peaceful for He loves His sheep even unto the end and in all Eternity.